For those of you who know me well, you know I am a very linear person. That is, I prefer to finish one thing before starting another. That’s why after a month in Denmark I still haven’t posted anything about my life here. My last posting was mid-way through my pre-Europe travels with Bryn and typically I would finish up that travel log before launching into something new. However I am also feeling guilty that my non-Facebook friends haven’t gotten to see any of the photos I’ve been posting online (and those of you who know me well, also know I can really go on a guilt trip). The guilt has overpowered my linear tendencies and I’ll get back to my travels with Bryn another time. 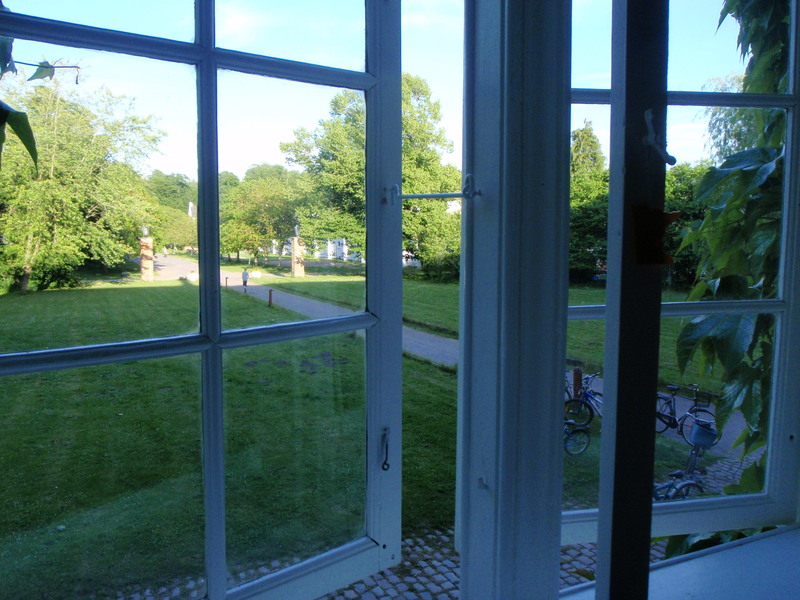 I’ve been living in Denmark for five weeks now. 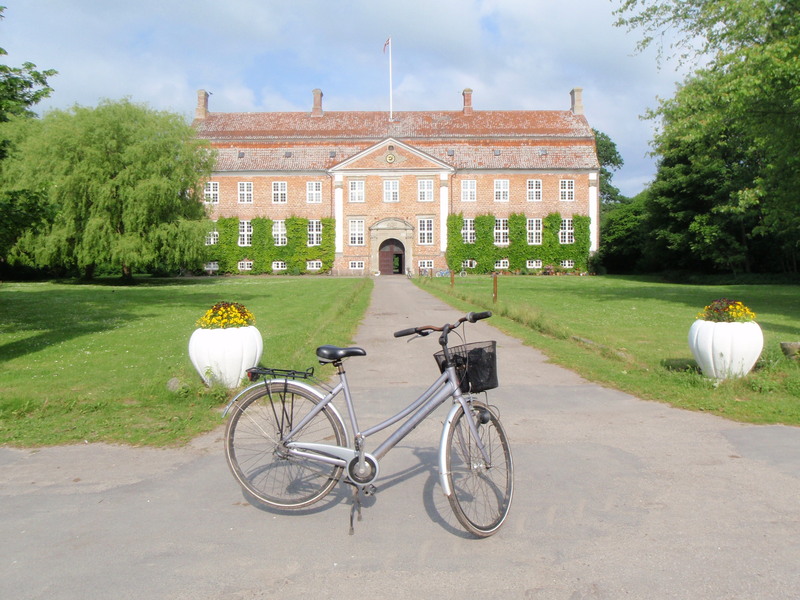 The community members at Svanholm have been very welcoming and have provided me with a cozy room in the beautiful old manor house and a bike to use while I’m here. Svanholm used to be a Baron’s estate and is made up of 1000 acres of both farm- and forest-land. In this photo, my room is on the first floor: the middle window to the right of the passageway, and this is my loaner bike. And here’s the view from my window. Svanholm has cows, sheep, pigs and goats. 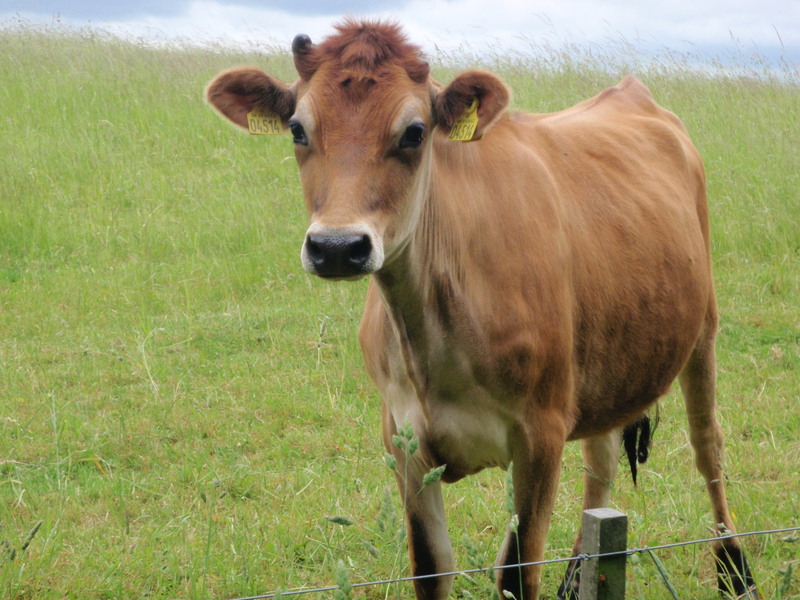 The cows provide us with milk and meat for our own consumption (we eat about three cows a month). 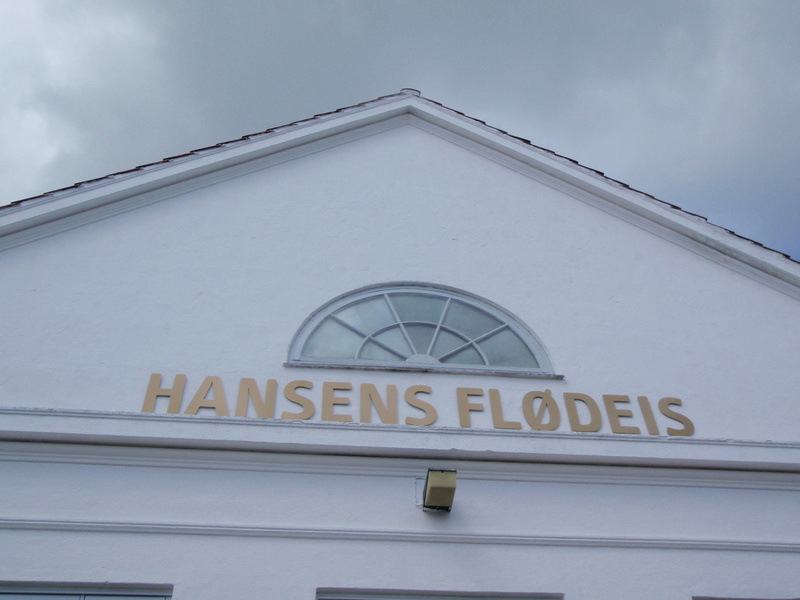 Since we only use a very small percentage of the volume of milk produced, the rest of it is sold to Hansen’s Flødeis, a nearby ice cream manufacturer. Hansen’s was founded in 1922 and takes pride in using organic ingredients. 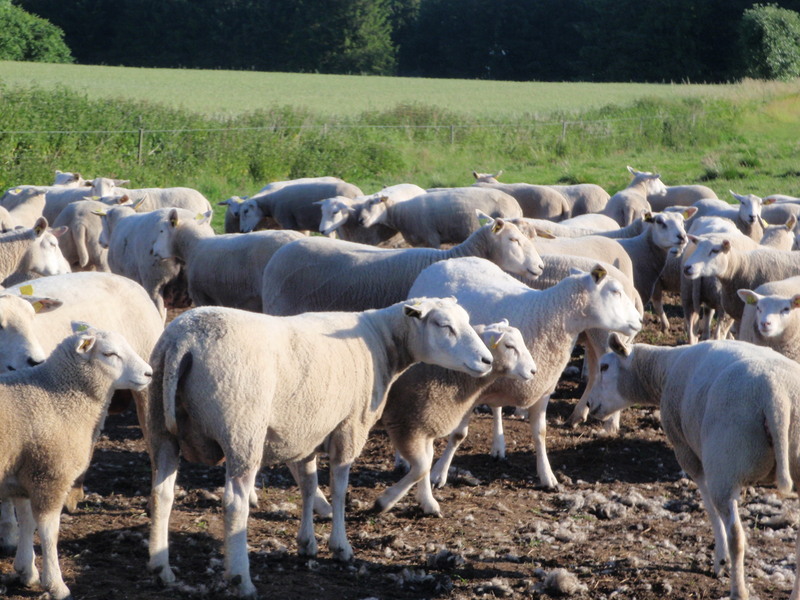 The sheep provide more meat, for our consumption and for sale to others. The wool is also sold for cash. Sadly we do not milk the sheep. The pigs are new this year. There are eight of them and they are extremely cute and friendly. I’ve fed them a few times when the two women who typically tend them have been away. 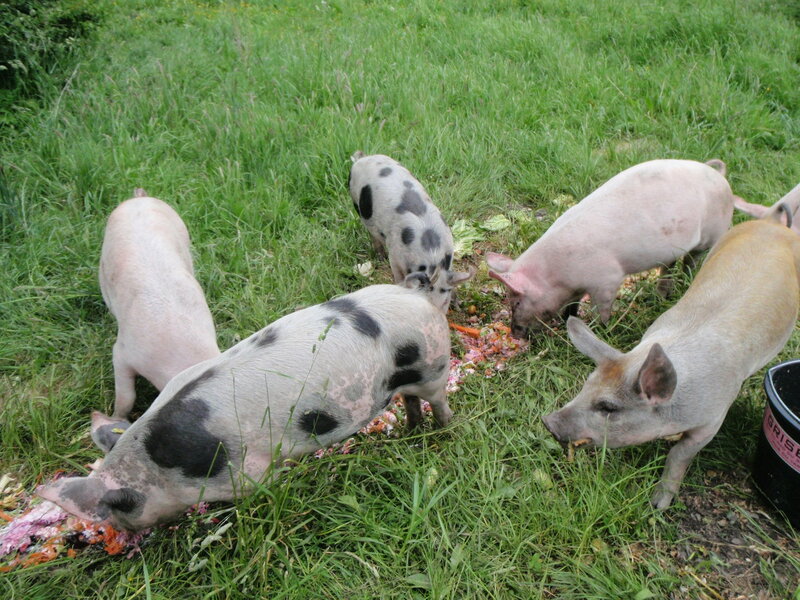 The pigs enjoy getting our table scraps and get excited when they see anyone carrying the slop buckets. It will be sad when they are slaughtered in the fall to provide our year’s supply of pork. 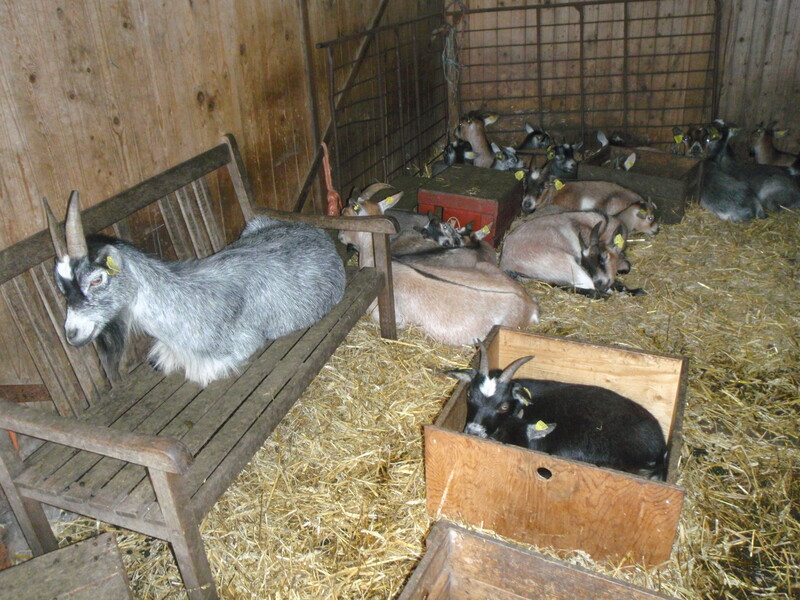 I caught the goats napping. They have a fairly large area in which to roam and like to nibble on everything, including one’s clothes! We don’t milk the goats and, as with the other animals, they are raised for meat, both our own consumption and for sale. The surrounding landscape is beautiful, with gently rolling hills. 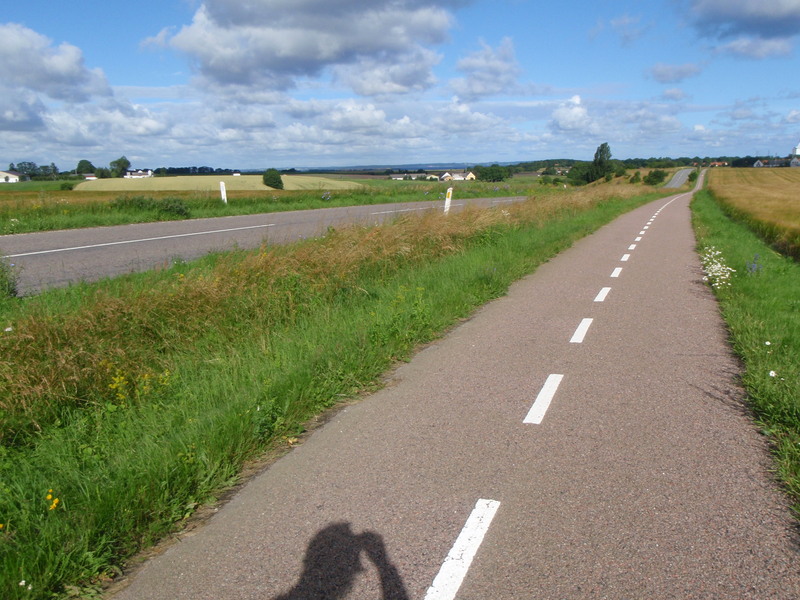 Denmark is quite flat, which makes for excellent bike riding. Many roads have adjacent bike trails, even out in the country, and I love seeing people of all ages out riding bikes. Many of the guests that come to Svanholm spend their days here weeding in fields such as this one. 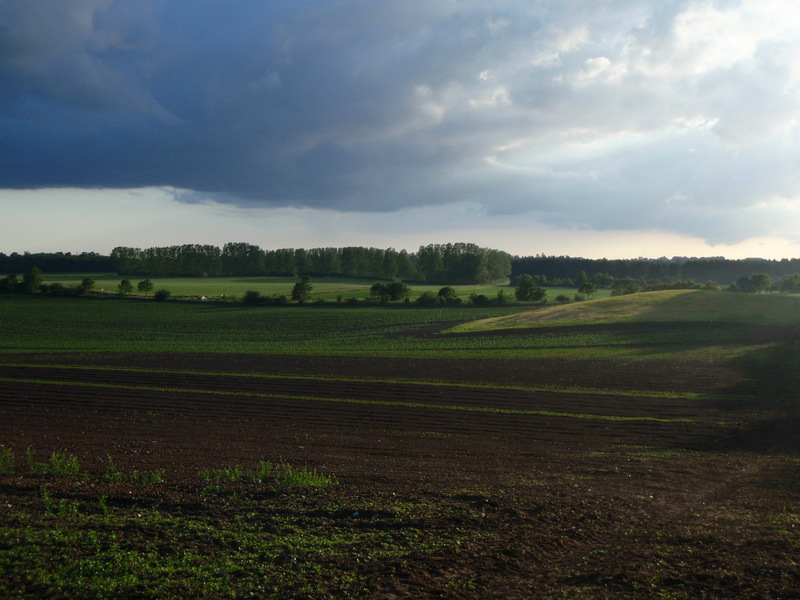 An organic farm relies on human labor instead of chemicals to allow the plants to flourish. 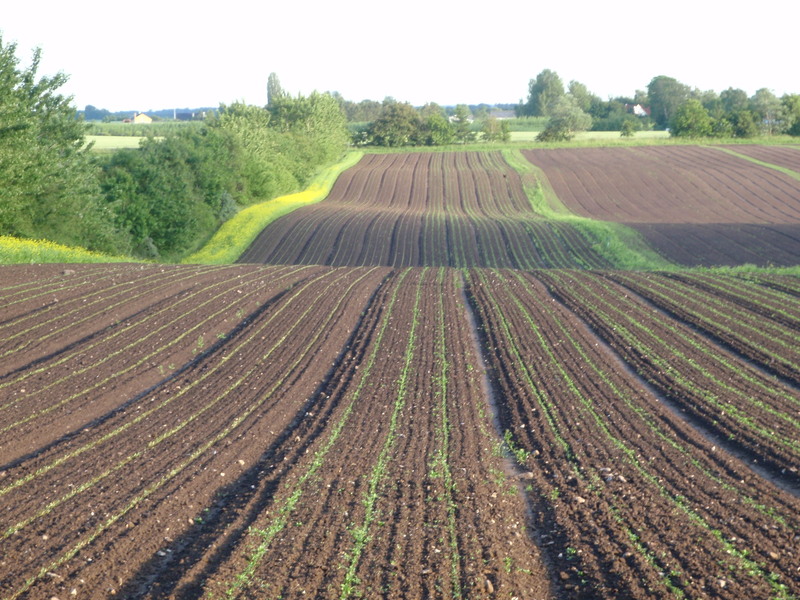 Here’s a view of more of Svanholm’s vegetable fields. There are, of course, other fields that are dedicated to livestock and growing hay. 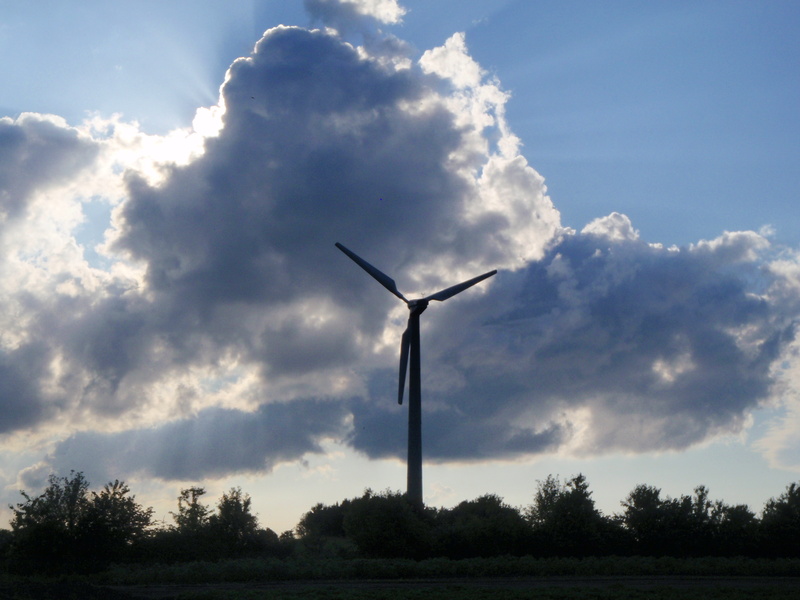 Svanholm has two windmills that not only provide all the electricity we need, but also serve as a revenue generator for the community. The farm also has its own water treatment system on site. Svanholm was purchased and organized as a cooperative in 1978. Members have come and gone over the years, purchasing or selling their shares, respectively. There are currently approximately 80 adult members and 40 children in the community. About half of the adults work off of the farm and contribute 80% of their salaries to the common economy. While 80% sounds high, keep in mind that Denmark’s tax rate tops out at about 50% and these individuals are exempt (the cooperative pays taxes, not the members), plus they receive room and board. The other half of the adults work on the farm in some capacity and receive a small, tax-free salary plus room and board. There are three working groups on the farm that accept guests: agriculture/farming, building/facilities, and kitchen. Other community members are employed in the office, tending the livestock, at the day care center, in the packing plant, etc. Guests work 30 hours a week and receive their room and board in return. 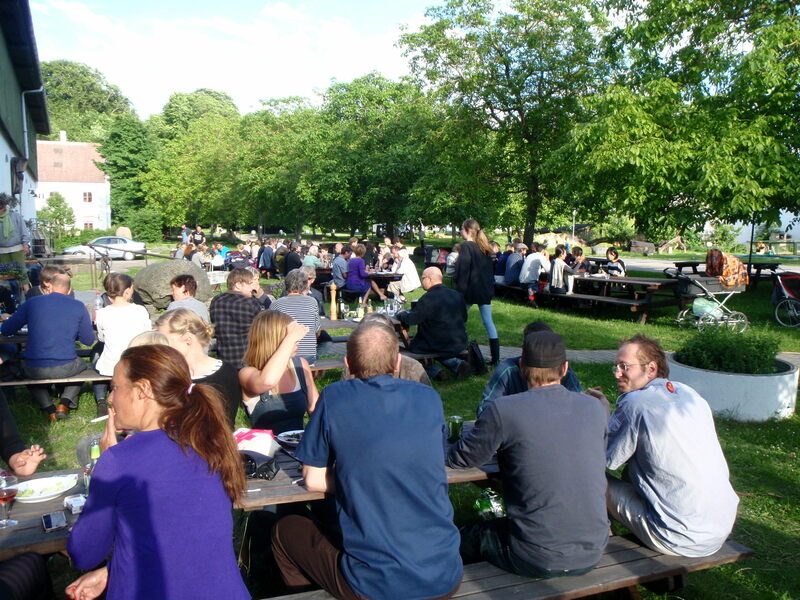 Guests that stay three months or longer also receive a small monthly stipend after the first month (1000 kr ~ $200). It’s not much, but one doesn’t need much when living here. There is even a storeroom with shampoo, toothpaste, laundry detergent, etc. of which anyone may avail themselves. I am a member of the kitchen group, working 30 hours between Monday – Friday. The kitchen group has overall responsibility for feeding everyone, which includes meal preparation and keeping the food supplies stocked for people to take home, if they choose. Lunch is served at noon Monday – Friday in the main dining hall/”big kitchen” and dinner is served every night except Wednesdays. Breakfasts, weekend lunch and Wednesday dinner one has in one’s “small kitchen” where one lives. My typical responsibilities include brewing tea for lunch, making humus, skimming the fresh milk for whipping cream and coffee cream, skimming the fresh yogurt for crème frais, making cream cheese by draining yogurt, preparing vegetables and salads, doing laundry, dishes and assorted cleaning jobs. I still aspire to make cheese while I’m here and the kitchen group is supportive. I’m on the hunt for a local source of cheese cultures and rennet, as well as figuring out if they still have cheese molds and presses here from days gone by. 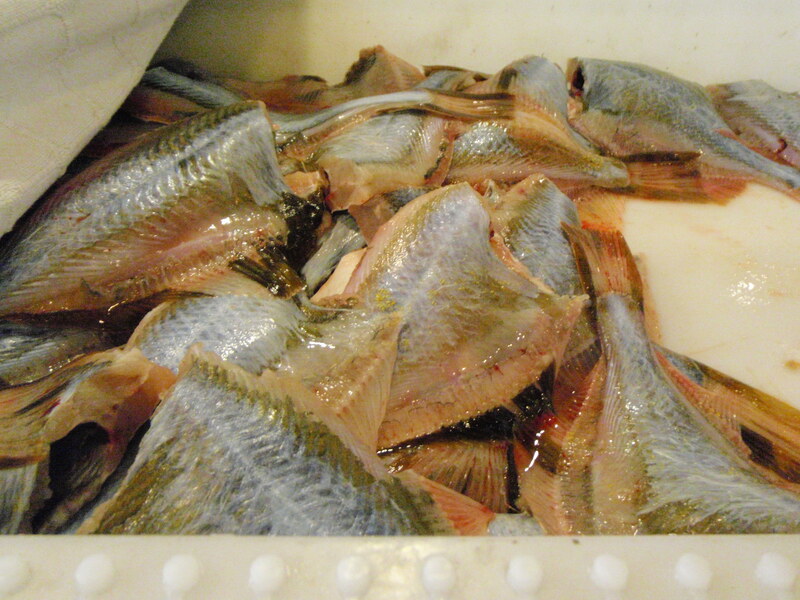 Here’s a photo of fish caught in the morning and delivered for the evening’s meal. 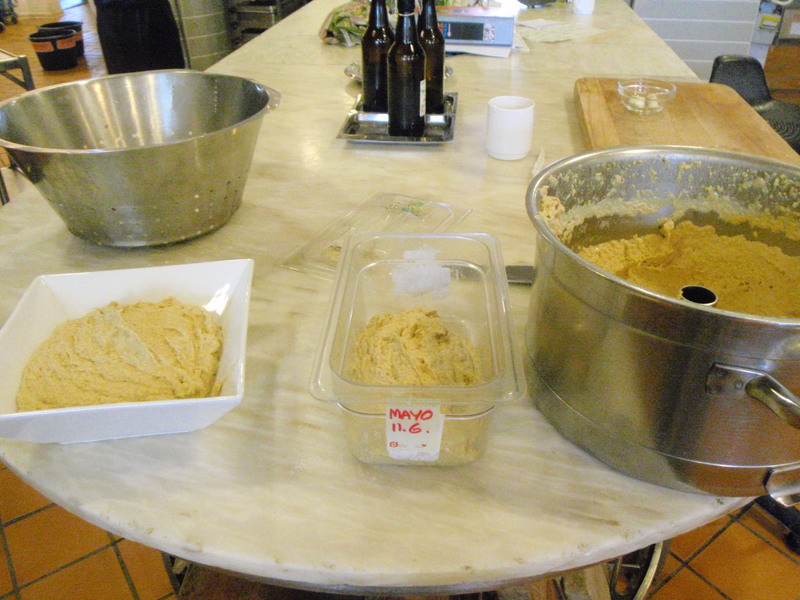 Here’s a photo of a batch of freshly made humus, some for the lunch table and some for the lunch refrigerator (I know the label says mayo — the new label went on after I took the photo). I have to admit I’ve been struggling with the humus, to get the right consistency (it’s either too dry or too soupy) and the right seasoning (I’m not aggressive enough with the spices). I’ll be making humus once or twice a week, though, so hopefully practice will make perfect! Well, I hope that’s enough to give a sense of the place. As my Facebook friends know, I’ve been off on various adventures in the surrounding area and to Copenhagen to visit Bryn. They also have seen photos from my Wednesday night feasts with the other international guests. I’m having a very good time here and, if you have any inclination to see things for yourself, let me know; I’d love to get visitors over the course of this next year! When you return I will be looking forward to humus making lessons! Thanks for sharing your life with us, Katy, it’s great to have an adventure vicariously through you! Your written “pictures” are even more precious than the digital ones! Thank you for sharing your new life! I, too, hope you’ll share your “perfect” humus recipe. Hi Katy, I’m retired now and Jim is considering it. If so, we’ll think about visiting you. What an adventure! Reminds me of my Peace Corps experience. Life changing. Enjoy!